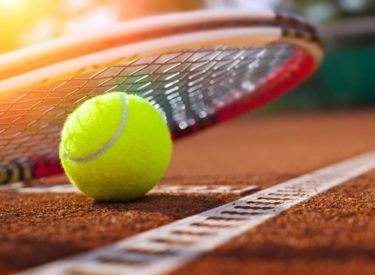 GREELY, Colo. – The Seward County Community College men’s tennis team lost a hard-fought match to Division I University of Northern Colorado, 4-3, on Saturday. The Saints, who had their six-game winning streak snapped, fell to 9-5. The Saints split their first two matches in doubles. No. 2 Carlo Izurieta and Francisco Vargas lost to Nick Wade and Julian Kenzlers, 1-6, while No. 1 Gabe Nery and Sander Jans beat Kyle Pease and Tommy Smalley, 6-1 . Seward dropped the doubles point with a competitive loss in the third match. No. 3 Nic Rousset and Nyathi Motlojoa were beaten by Adolfo Arroyo and Michael Kritzinger, 4-6. It looked as if the Bears would make quick work of the Saints as singles competition started, jumping out to a 3-0 lead when No. 3 Nery lost to Kenzlers, 2-6, 4-6, and No. 4 Vargas was defeated by Alex Exsted, 4-6, 4-6. Seward battled back and crawled within one point at 3-2. Both No. 1 Rousset and No. 2 Jans rallied from one set deficits to beat win their matches. Rousset beat Pease, 3-6, 6-2, 6-3 and Jans knocked off Arroyo, 3-6, 6-1, 7-6. Northern Colorado took the clinching point when No. 6 Franck Soulerot lost to Smalley, 6-7, 2-6. No. 5 Izurieta knocked off Wade, 6-3, 3-6, 7-6, for the final Seward point.